In a week where South Africa celebrated the 20th anniversary of the release of Nelson Mandela from his jail on Robben Island, it is easy to forget that at the same time, 900 miles away in Johannesburg, one of cricket's most ill-advised and wretched tours was careering towards an early conclusion. The second English rebel tour to South Africa was in stark contrast to the first eight years earlier. While that had attracted international opprobrium, inside South Africa it had been largely welcomed, certainly by the ruling minority white section of the population. 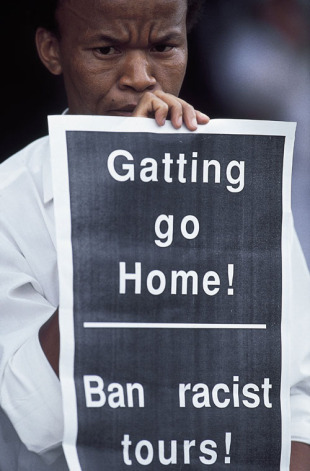 By the time Mike Gatting's team arrived in February 1990, the apartheid regime was close to the end and the country was in a high state of agitation. The rebels had assumed they were trading cash for a three-year ban, the punishment meted out to the 1982 squad. But no sooner was the venture revealed in the summer of 1989 than those involved found themselves villified in the British press and rounded on by the public. To make matters worse, between then and the scheduled start, the political situation in South Africa deteriorated rapidly. The team's arrival was almost irrelevant in the great scheme of things, but it provided the increasingly confident anti-government movement, freed a week or so into the trip to protest by President FW de Klerk's relaxation on protests and demonstrations, with a high-profile target. 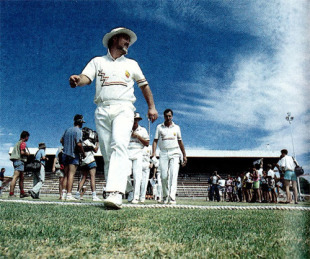 From the off the cricket was secondary, and Gatting, while trying to downplay angry scenes when the squad landed in Johannesburg (after having to evacuate their plane at Heathrow because of a bomb scare) just poured fuel on the fire when he naively dismissed protests as "a few people singing and dancing and that was it". John Emburey, his county team-mate who went on both rebel tours, admitted: "Gatt has never been any good at making public statements". If anyone in the squad still believed the tour could progress normally they were brought down to earth on the second day, when the predominantly black staff at their hotel refused to serve them. At one restaurant where the same thing happened, Gatting reportedly circumvented the problem by going into the kitchen to cook steaks for himself. "Luckily the veg was all cooked up. Gatt whacked on the old chef's hat,s and I found myself waiting tables with Alan Wells and Paul Jarvis," said Matthew Maynard. As for the games themselves, they were incidental to the backdrop against which they were played. "As you looked away in the distance you could see this cloud of dust," Bruce French, the rebels' wicketkeeper, told the Times, recalling the tour opener in Kimberley, which was played against the din of riots outside the ground. "Slowly it got closer, and this 'umba-umba' noise came with it. Of course it was 3000 people turning up at the ground to demonstrate." At the next match, in Bloemfontein, Gatting was again thrust into a political limelight he was clearly not able to cope with. Police had used tear gas and rubber bullets to disperse a crowd when he was called on to receive a petition from demonstrators. As Gatting did so in front of the media, a protestor, John Sogoneco, lifted his shirt to reveal buckshot wounds. Although the result of recent police action, they had not been inflicted at the cricket. "It has nothing to do with us," Gatting said. "We can't be held responsible for anything that happens away from the ground." In Pietermaritzburg on February 3, Gatting showed courage in walking into the midst of an angry crowd of around 4000 outside the ground to listen to what they had to say. On the way back, he was pelted with stones and coke cans but maintained a brisk stride the whole way back to the pavilion. "I thought Gatting might get killed there," recalled Ali Bacher, the player-turned-administrator who had been instrumental in arranging the tour. "I realised for the first time that those earlier tours were peaceful only because if there had been demonstrations those people would have been locked up in jail." On reaching the dressing room, Gatting picked up his hat, barked "C'mon lads, off we go" and led his players back onto the field. Incredibly, the only mention of protests in the Cricketer's tour report dismissively said the squad had been "harassed throughout" and then added the almost ludicrous comment that Gatting "was enormously popular with the cricketing public". Nelson Mandela? He can't bowl, can he? The first five-day international started on February 8 and the fragile England XI went down to a defeat inside three days. "Hundreds of black spectators were bussed in to ensure a multi-racial audience for the cameras," reported a local paper, "while outside 2000 demonstrators were dispersed with tear gas." On February 12 a bomb exploded outside the Newlands ground, and 24 hours later came an announcement the tour was to be shortened by a fortnight, a decision that appeared to have been made without consulting Gatting's side. 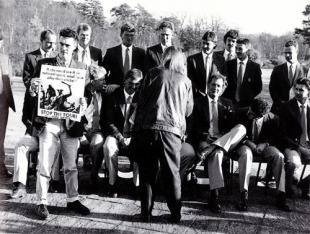 From then on the protests subsided, although they might not have done had it been widely known at the time that the England players were being bankrolled by de Klerk's government rather than corporate sponsors. The squad finally returned home on February 24. "No more inglorious, downright disgraced and discredited team or sportsmen wearing the badge of 'England' can ever have returned through customs with such nothingness to declare," wrote Frank Keating in the Guardian. The Daily Mirror added they had "disgraced their country and their sport". At the time Bacher tried to put a brave face on the venture, but two decades later he was more realistic. "I must confess that if I had known the anger and the hurt that those tours would cause, I would have thought twice about them. It was very hurtful for me. I had been a liberal all my life." Neil Foster admitted it "wasn't an enjoyable place to be, or an enjoyable tour to be on" but added he did not regret going. "In a bizarre way, we did help change the country." Emburey was less convinced: "It was a trip that took place and in hindsight maybe shouldn't have done." "The scene was a lot different to the one that was painted to us," Maynard said. "A lot of promises didn't materialise." Gatting, the man at the centre of the whole business, has never spoken at length about the affair. "All I will say is that it turned out well for South Africa," he told the Sunday Telegraph earlier this year. "Not that that had anything to do with us. Clearly, Nelson Mandela is a very great man."